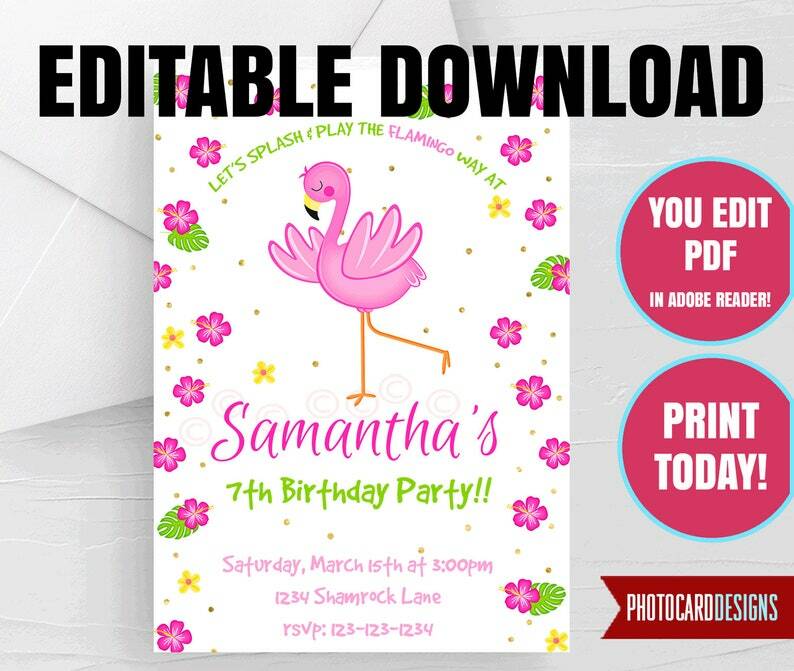 Send this pretty Flamingo Birthday EDITABLE Invitation! * You will need ADOBE READER to Edit. * PDF files do not work with mobile devises, unless you have an Adobe account that offers mobile apps. *NO REFUNDS OR CANCELLATION ONCE INSTANT DOWNLOAD IS COMPLETE! 2. After Checkout, you will be redirected to the download page. If you are not, you can find it in your account under "Purchase". You will also receive an email with a link. 5. Open the FONT instructions FIRST. Follow instructions to load the fonts. 6. Open the PDF invitation file in Adobe Reader. The easiest way to do this is to double click on your PDF file and it will open in Adobe Reader. 7. After the Invitation is complete, save the file and Print. With this listing, you are purchasing a DIGITAL file. NO printed &/or physical items will be mailed to you. You will receive the files for this order under Purchases only. IMPORTANT NOTE: Your PDF file is for personal use only. You may not forward, share, sell or distribute your file. It is for non-commercial use only. Photocard-Designs.com retains all rights. Copyright Notice - All copyrighted and trademarked characters and marks belong to their respective copyright and trademark holders .. Payment & sale in this listing is ONLY for my creative service offered, including the customer’s text, customization, labor & supplies. These items are for personal use only. EDITABLE Unicorn Invitation, Unicorn Birthday, Unicorn Invitation, Unicorn Party, Birthday, Digital. INSTaNT DOWNLoAD, EdIT & PRiNT TODAY! EDITABLE Dirtbike Invitation, Dirt Bike Printable, Birthday Invitation, Motorcycle, Dirtbike, INSTANT DoWNLOAD, you EDiT & PRiNT TODAY! EDITABLE Camping Invitation, Camping Printable, Birthday Invitation, Camping Party, Outdoor, INSTANT DoWNLOAD, you EDiT & PRiNT TODAY! Editable Beach Invitation, Beach Invitation, Invitation Printable, Birthday Invitation, Beach Party, Digital, DOWNLOAD, EDiT & PRiNT TODAY! EDITABLE Bunny Invitation, Easter Printable, Birthday Invitation, Bunny Party, Easter Party, INSTANT DoWNLOAD, you EDiT & PRiNT TODAY! EDITABLE Teacher Appreciation Week Printable, Teacher Appreciation Schedule, Classroom, INSTANT DoWNLOAD, you EDiT & PRiNT TODAY!